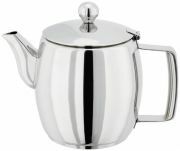 These teapots are suitable for all heat sources including Induction, Gas, Electric, Halogen, Ceramic coming in a variety of sizes. Facts about using an induction hob and induction suitable kitchenware. When you adjust the heat on an induction hob the heat adjusts almost instantly, it will reamain cool to the touch so over spills or boil over won’t burn in situ and can be wiped clean without having to wait for the hob to cool down. Unlike any other heat source there is no wasted energy. The heat is inducted directly into the cookware giving you the more efficient energy usage. With induction cooking, energy is supplied directly to the cooking vessel via a magnetic field; thus, almost all of the source energy gets transferred to that cookware. Please note the size of your induction plates and always use cookware/kitchenware in keeping with the size of the plate. You can always place a smaller base on a larger plate but not recommended to do the reverse. If you place a larger based on a smaller plate then you will have parts of the saucepan that will not heat as the induction plate is too small.